What a difference a day makes. On Monday, this blog reported The Philadelphia Inquirer was paying former publisher Brian Tierney $25,000 a month to run a national advertising campaign that flopped. Today, according to two sources, the newspaper fired Tierney. 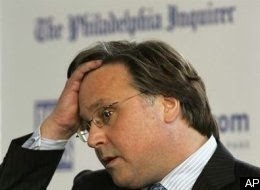 Tierney was the former Inky publisher and CEO of Philadelphia Media Holdings LLC, the firm that bought the Inquirer, the Daily News and philly.com for $515 million in 2006, and then went bankrupt three years later. After the two newspapers and the website were sold at an auction to creditors, Tierney stepped down in 2010 as publisher and CEO. He returned this year to direct a national sales campaign. Tierney, who did not respond to Bigtrial's request for comment, had plenty to say about his departure to reporter Tom Fitzgerald of the Inquirer. Tierney called the loss of his consulting job "collateral damage of institutional fighting." Tierney's salary of $25,000 a month was supposed to be offset by the advertising revenues he generated, but the campaign was not successful. "He has underperformed," a source close to the situation said Monday. Tierney, however, a legendary spinmeister, told a different story to Fitzgerald and the Inky. "All of those we worked with at the Inquirer have not only been pleased but delighted by the results we have generated," Tierney told his former newspaper. On April 23, 2012, Nancy Phillips said in an email to company executives that she was sending Tierney a "non-disclosure agreement" so he could "be available to help." At the time, Phillips was a reporter in the newsroom and a member of the Newspaper Guild of Greater Philadelphia. But she was also the girlfriend of Lewis Katz, one of the new owners who bought the Inquirer. There were delays, however, in Tierney coming aboard. He did not return to the newspaper until this year, according to a source close to the situation. He worked for six months and earned about $150,000 before being fired, the source said. However, Mike Lorenca, the Inquirer's associate publisher, told Tom Fitzgerald that Tierney began work in April and would leave Nov. 30. Those estimates would mean Tierney was on the job for eight months and ostensibly earned $200,000. The firing was in the works at least a week ago but the publicity over Tierney's new role accelerated his departure, a source close to the situation told Bigtrial.net. Lorenca told the Inquirer the decision to can Tierney had been made after "we just conducted a review." Meanwhile, disgruntled Newspaper Guild members released a statement calling for an end to the infighting and lawsuits in the battle over the two daily newspapers and philly.com. "What are the workers supposed to do when the infighting of their company's owners jeopardizes both their company and their careers?" said the statement from Bill Ross, the Guild's executive director, and Howard Gensler, Guild president. "That's what's happening at the Philadelphia Inquirer, Philadelphia Daily News and Philly.com, where a group of the region's wealthiest men have taken their disparate views of the company [Interstate General Media], its role in the community and their personal dislike of each other to a new level of wastefulness -- recently filing multiple lawsuits against each other in two jurisdictions." "As both sides dig in, there's been name-calling, memo-leaking, email reading and more," the Guild statement complained. "There have been owner-on-owner accusations of meddling in the newsroom, killing worthy stories and playing up unworthy ones. This behavior has done only one thing, damaged the company's greatest asset, its credibility." "It can't continue," the Guild statement said. Ross and Gensler said the Guild attempted to act as peace-makers in the dispute. "With pledges of investments from both the present owners and/or from outsiders we have solicited, the Guild has offered to buy out either or both of the warring ownership groups," the statement said. In response, "Each side has said the same thing: 'We're not selling.' "
"And so we are at a stalemate, unable to move forward and wasting potentially millions of dollars on legal fees, when the company's unions as recently as February gave back more than $20 million in wages and benefits to help turn around this company's finances," Ross and Gensler wrote. "It's a disgrace." In response, Dan Fee, a spokesman for the majority owners of Interstate General Media, said in a statement, "The majority owners, who together hold 58 percent of the company, and represent four of six directors, applaud the Guild's statement." Fee said the majority owners "stand ready to work with the [the Newspaper Guild] to resolve these issues. It is their commitment to the long term interests of the company, including the sacrifices they and other employees have made, that have helped put the company on the path to profitability." "The majority owners neither wanted nor began this litigation," Fee wrote. "Their mission was and is to make this a successful company and provide the type of quality journalism that will make every employee proud and that our community deserves." Ralph, is the message that the Guild is ready to get in bed with Norcross? I think they want to stay independent. But there's a lot of anger about Tierney being back on the payroll. Especially since he nuked the Guild pension plan for everybody. Hokey smoke $25K a month to Brian Tierney to fail again.